Doty & Sons Concrete Products Inc. now offers new B.Y.O. Bags All Concrete Bag Toss Game Set. B.Y.O. Bags is perfect for parks, campgrounds, playgrounds, colleges, schools and more. Features include all concrete construction, heavy-duty design with smooth top surface, regulation ACA size and slope, concrete border for easy mowing, and optional accessories. Doty & Sons offers a complete line of concrete site furnishings. Witt Industries offers a wide variety of durable metal waste and recycling containers for outdoor use. With styles to match any décor, Witt containers are an ideal addition to existing streetscapes or for new projects. Manufactured of durable steel with vandal-resistant features, these high-quality products complement existing site furnishings in outdoor locations such as stadiums and arenas, parks and recreational facilities, city streetscapes, office building exteriors, multi-family residences, school or church grounds and more. 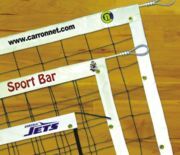 Carron Net now offers full-color, digitally printed lettering and logos on any of their top-quality volleyball nets. Personalized nets are great for special events and fundraisers, advertising companies/organizations and showing team spirit. One charge covers printing and setup with no screen charges or other hidden costs, making even single net orders affordable. With a full line of high-quality nets and accessories for virtually every sport, Carron is your one-stop sports net source. One of the features in the 2010 Perform Better catalog is the DynamaxTM Medicine Ball available in nine different weights from 4 to 20 pounds. All DynamaxTM weights are a comfortable-to-handle 14-inch diameter. DynamaxTM is easy to catch and throw, doesn't bounce and has a soft feel, yet is covered with a heavy-duty vinyl covered nylon that is water and scuff resistant. Sold with a two-year warranty and most important, it holds its shape after repeated use. SeaKlear's popular Non-Toxic Phosphate Remover for pools now removes up to 3,000 ppb of ortho-phosphates per 20,000 gallons of water—triple its previous strength. This product has proven a reliable, safe and effective way to eliminate phosphates that enter pool water from fertilizers, cleaners, rainwater, soaps, decaying vegetation and other pollutants. It will not harm children, animals, plants or fish, and is part of the proven family of reliable SeaKlear water treatment solutions designed to keep pools clear and clean, easily and effectively. When soccer, football or rugby teams share the field, Bison Combo Goals are the answer. All Combo Goals provide official 24-foot by 8-foot soccer goals and official 10-foot-high football crossbar and 10-foot uprights that can be installed at 23-foot, 4-inch high school or 18-foot, 6-inch college widths—or at rugby width for added versatility. Constructed of weatherproof 4-inch square aluminum extrusions, the upright and crossbar have large corner radii for player safety. Combo Goals include Bison's popular QwikTrack net attachment, Torque Tested backstay design and eight-year warranty. Both in-ground permanent/semi-permanent and portable styles are available.